Cummins new INLINE 7 Data Link with Cummins INSITE 8. About this new Cummins INLINE 7 Cummins Insite 8.3 Data Link Software,there are some tips and notes when you install. 1.Cummins INLINE 7 driver still use INLINE 6 one. 2.Cummins INLINE7 software needs activation,and the activation needs to be submitted through their software and requires their background authentication to pass the activation success. [The activation is bound to the computer] And this activation process will take time,you may need to wait some time. 3. Can not start software from the inline software you installed ,must enter through their software. 4 You can use 3 years after software authorization succeed.And each authorization can be used 70 times. We will provide one time free activation, after you use up the times or after 3 years,may need to pay extra fee. 5.Once activation succeed,you can not change the computer,please do not exchange motherboard/memory /cpu. If you have changed,you need to re-submit the serial number to factory processing customer can activate. 6.The calibration in the inline7 U disk can only be used for 6 months, but the software supports online download calibration. After 6 months, please search and download the calibration. 7. 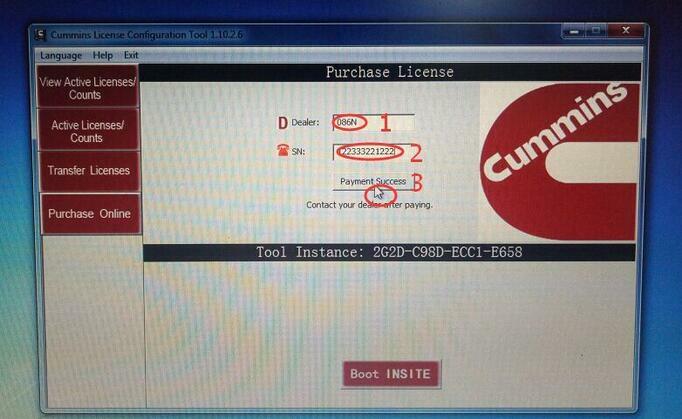 Customers who install Chinese software can only use Chinese activation to start the Cummins INSITE software. If it is a different language, please activate the software in English. 8.Input dealer code,and then send us serial number.After process well,then click payment scucess,then it will be OK.